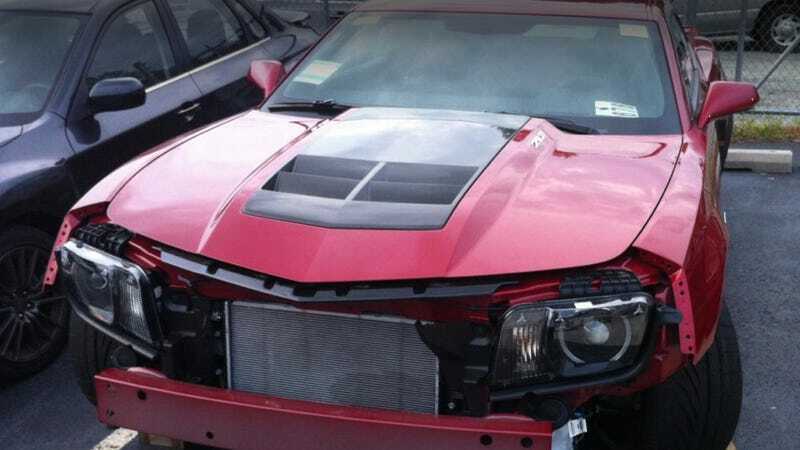 Brand new ZL1 Camaros don't usually sell at a discount, but when a Virginia Chevrolet salesman crashed a red 2012 model that had already been sold, his colleague got down to brass tacks with a Camaro fan who wasn't too concerned about fixing a $10,000-plus repair bill. According to a Friday afternoon post from a GTO fan site member, the dealership's sales manager was the one who did the car in. sales manager was driving, claims he was going 65 and shifted 3-4 and all hell broke loose. went across the grassy median 3 times bouncing off the curb on either side. sounds like they were going a lot faster than 65 to me... they were gone no longer than 20 mins i think. funny thing (to me, anyways) is that the guy who had already bought it dropped by to see it since he knew it was there. got a pretty big surprise. management told him a "renegade lot porter" stole it. neither of them were fired. nothing happened as far as punishment. coslyn (sales manager) drives a yellow 2006 c6 w/o mufflers around and thinks he has the fastest car in the world. sales at that place takes out anything fast and dogs it before anyone can buy it. Discussion, along with pictures of the damaged vehicle, continued on a Camaro forum, then — of all places — on LS1GTO.com, a Pontiac aficionado forum. One of the Camaro folks had posted photos of the car with flat tires, damaged wheels, and a banged up front clip at Lindsay Chevrolet in Woodbridge, Va.
Camaro forum posters pointed out that the ZL1 had arrived at the dealership shipshape in Bristol fashion, but the next morning, was in its current rough shape, despite there being only 11 miles on the clock. It's currently up for sale again, and Lindsay Chevrolet General Sales Manager Coslyn Ceballos assured me when I called Friday afternoon that "everything is 110 percent" on the abused ZL1, despite the damage. "We don't know if the car is totalled. We don't know what's wrong with the car." That's not what we heard. Erstwhile, an interesting online conversation between goat fiend wlorton — the owner of a 2004 GTO interested in defecting to the halls of Chevrolet — and Lindsay salesman Billy Riggs popped up about what could become of the battered pony car. Billy Riggs: Hello, How may I help you? Billy Riggs: are you interested in buying it? wlorton: Depends on the pricing, I cannot see paying full price for something that has seen that type of damage. Does it appear on the carfax? Billy Riggs: I am not sure if it shows or not. What would you be willing to pay? Riggs went on to assure wlorton that the car does not have a salvage title, and that once the repairs are done, "most people wouldnt even now it had been wrecked." After quite a bit of back and forth about whether or not the car is totaled (Riggs insisted it wasn't), Riggs offered to pull the ZL1 out of the repair shop and sell it as is for $50,000. Then wlorton got him to spit out a solid repair cost estimate: $10,251. We're not quite sure what the current market demands for a 2012 ZL1, but Kelley Blue Book's MSRP figure is $58,065. That means that ol' wlorton would pay more than 60 grand for a less than perfect Camaro. Well, unless he felt comfortable doing his own repairs on a brand new car. In response to Riggs' offer, wlorton tried to trade his "ultra Rare 2004 Silver GTO with Red interior and a few touches to make it appear as an 2006 GTO, which puts it in roughly 10-20 cars like it" for the ZL1. wlorton: Would you be interested in a direct trade? wlorton: So after repairs what will the price of the vehicle be? I am just trying to consider all of my options. wlorton: Ok, well let's do this. So wlorton asked for an itemized list of the repairs needed on the car, a request Riggs danced around like a Ceballos-manipulated marionette. The conversation fizzled from there, and the chat session eventually timed out. A few hours later on Friday morning, GTO owner paarman got in on the fun by shooting Lindsay's sales staff a message of his own. Johnnan Johnson: Hello, How may I help you? paarman: Hello, I am curious to know if you still have the ZL1 with deployed airbags. (!) The Agent has left the conversation. You are no longer connected. Thank you for your interest. Ceballos denied knowing anything about Riggs' conversation with wlorton, or how close the car may (or, in reality, may not) have come to being sold. When I asked him what exactly was wrong with the car, he said he wasn't sure, and that it could cost $10,000 or $20,000 to fix. He just didn't know. Ceballos said he was also unaware of what had happened to put the ZL1 in its current condition.